If you were between the ages of 25-35 back in 2005, you are all to familiar with the concept of a Sunday Funday. My version of Sunday Funday involved being out pretending you had a life at least on the weekend, and part of the facade involved day-drinking with your pals cramming as much fun into the last vestiges of the weekend to carry your through an otherwise monotonous week. If you are like me, and were (are) single, your Sunday Fundays were basically two things (1) all-day and (2) boozy. I, a single woman in a large metropolitan area, typically start off Sunday Funday with brunch. It is just what civilized people do. Sundays are for brunch. What is brunch for? Mimosas, bloody marys, and carafes of deceptively strong sangrias. Oh wait there is also an artisanal craft brunch cocktail menu too? Well don’t mind if I do! I already sound like a binge-drinking yuppie I know, but I promise you I am not. I am also a foodie, so of course it would have to be a hip new brunch spot where the chef is doing inspiring things, deconstructy things, things that are worth the extra calories. I know this will sound bougie, but I don’t get dressed and leave the house for things I can make myself. I don’t apologize for that, it is how I choose to live my life. I can make french toast, I can’t make duck confit benedicts. The rest of a my typical Sunday Funday shenanigans would involve doing some outdoor activity after brunch, arboretum, pool, walk in the park. Or, if it was cold outside, the movie, museum, or bookstore. Then it was onto a late lunch, maybe a nap, or another activity, then dinner. Throughout all of that, there would be at least one cocktail in hand. I should actually review cocktails on this blog. Making a note of that. Hey that is a good segue into the perfect cocktail for the moment. So I just decided that like movies and TV shows have soundtracks that encapsulate the moment, we have try and do that with a cocktail. Whether the taste of the alcohol, the fragrance of the garnish, or the flavor of the juices and spices mixed in, smells and tastes evoke memory. And I don’t know about you, but sometimes I forget the words to songs and it is off-putting to hum along while something is happening in real life. But a cocktail, want to remember that labor day weekend in Destin? What cocktail were you drinking? See, now every time you have that drink you will think of those fun time. On to the first official cocktail and life moment pairing…drum-roll please. 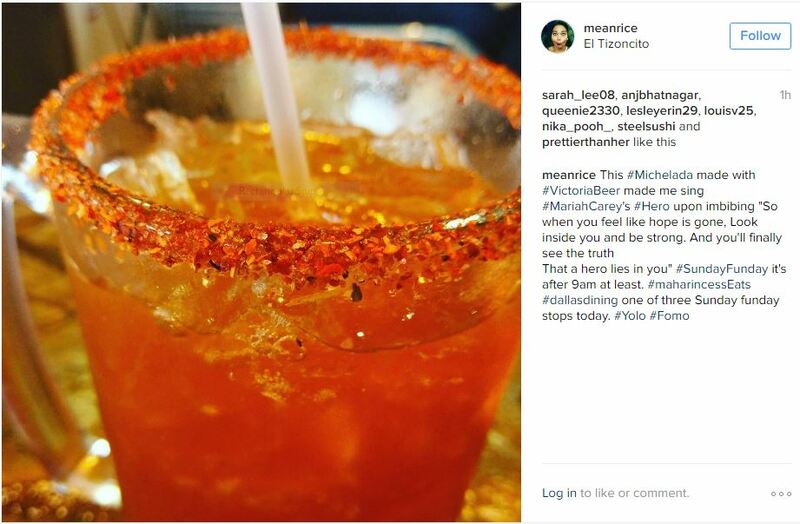 The perfect cocktail/drink for the moment when you gave yourself a reality check and stood up for yourself before 9 A.M. on a Sunday: the Michelada. Just look at it! I had it while I was waiting for my to-go order of tacos. What is in a Michelada? It is essentially beer (in this case Victoria) + Clamato Juice + Worcestershire Sauce + Spices + Lime Juice. Alternately, this drink would be equally satisfying as the cocktail you have when you’re sure your neighbor thought he witnessed you in a walk of shame. Make it a great day friends. Happy Sunday Funday.